SOCKSNBULK Women's Diabetic Cotton Crew Socks Soft Non-Binding Comfort Socks Size 9-11 White at low wholesale prices. 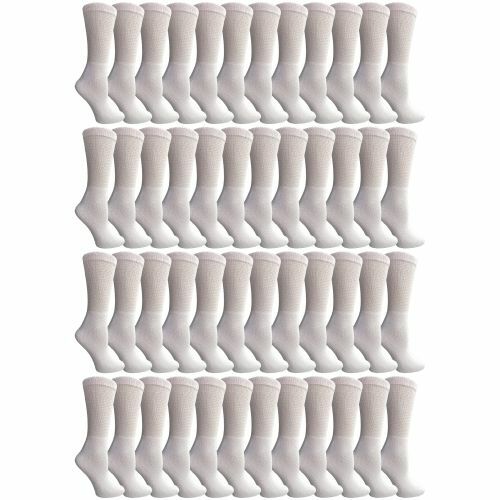 Socksinbulk.com offers Women's Diabetic Socks at bulk discounted prices. COMFORTABLE & LIGHTWEIGHT: Solid color diabetic crew socks. Lightweight and Non-Binding great for blood circulation. Loose fitting style won’t constrict your legs and slips on easily over swollen ankles and feet. The absolute best pair of socks for people who suffer from edema, diabetes and neuropathy.Perfect for recovery after surgery or long hospital stays. THERAPEUTIC CUSHIONING: Get all day comfort from these soft cushioned therapeutic crew socks. Great for walking and will help prevent swelling in the feet and ankles. If you have circulation problems these socks will help improve blood flow by reducing the amount of constriction around your calves and ankles. Antimicrobial features prevents bacteria and fungal growth for increased orthopedic health. PREMIUM QUALITY: Constructed of high quality cotton with just the right amount of stretch. Keeps their shape and stretch through many washes. Soft breathable material is ideal for people who wear shoes and socks all day long. Our diabetic socks are made to decrease the risk of foot injury, and avoid preventing or slowing blood circulation. They are made of materials that have superior abilities to wick away moisture, are fitted, padded, and nonbinding, and do not have seams. 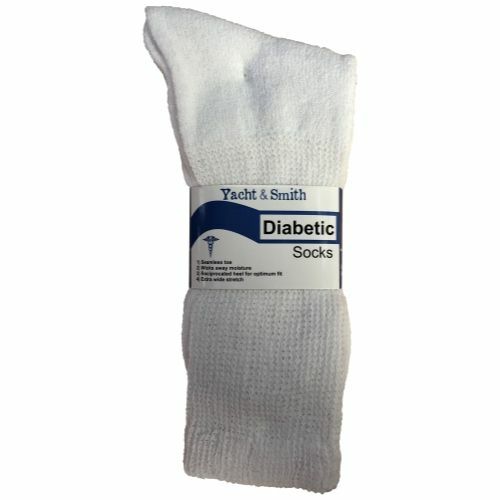 BULK VALUE: Get a value pack of diabetic socks at an affordable price. This perfect blend of fibers alleviates pain and swelling and makes a great gift for your loved ones. Charity organizations and homeless shelters can rely on getting the absolute best prices and great quality. We are proud to work with nonprofits, shelters, hospitals and church organizations providing bulk prices and excellent quality to reach their goals. 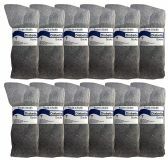 Bulk pack of Womens diabetic socks in solid colors. Protect your feet from the elements with a quality pair of women's diabetic crew socks. Loose fitting design doesn’t constrict blood flow and slips on easily over swollen feet. Solid colors & breathable material great for everyday wear. Perfect for those suffering with edema and diabetes. Diabetic socks are an important tool in diabetic foot care, fortunately, the right pair of diabetic socks can help provide comfort and alleviate foot pain. 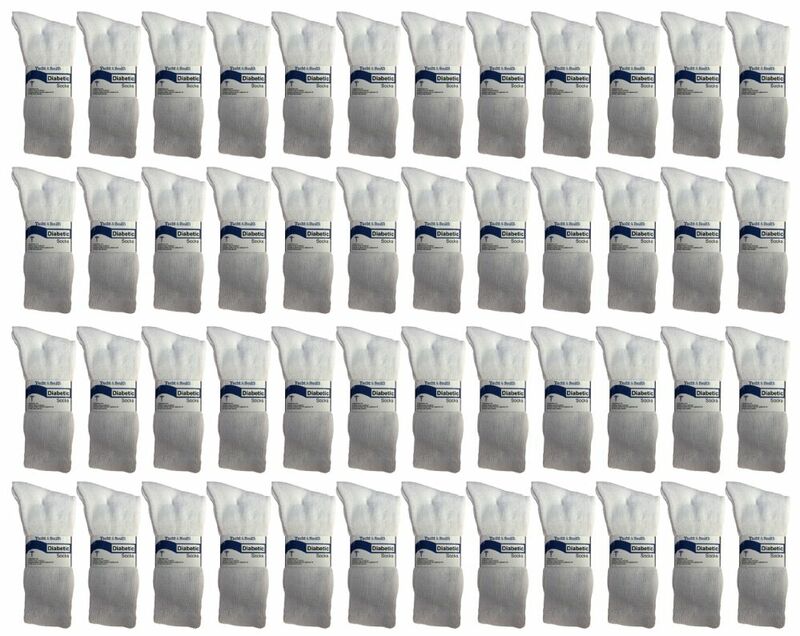 Get the most for your money when you buy wholesale diabetic socks in bulk.